Sunlight dappled the beechleaf floor of Dumcrieff Wood. But as the track rose out of Moffatdale there was an autumn chill in the air. At the 200m contour I entered plantations. But at once, the path dipped to a footbridge above a little waterfall, then staggered through clear-fell above the stream to reach another forest road. And here the way turned uphill under a band of birch trees. The well-crafted path mounted in zigzags like something in the Alps, carrying even weary feet seductively upwards. I emerged high in the plantations, with much wider views back across the valley I'd just crossed. And a short tree gap led out onto open hill, with a tiny path through the heather. The ridgeline narrowed along the tops of the steep and stony Crookedside Sklenders. All this was, back last Autumn when I walked it, strictly unofficial. I was sneaking through on a Sunday to avoid the forestry operations. Almost vertically below me, invisible inside the gloomy spruce, ran what would still be, for another few months, the actual line of the Southern Upland Way. 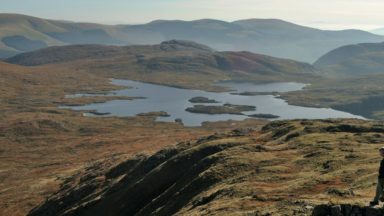 The high path that will, by the time you read this, have become the official Southern Upland Way continues over the airy summit of Croft Head; bringing the path above the 600m (or 2000ft) line for the second time in its 350km passage across the width of Scotland. The path itself was built back in 2008, so has grassed over and blended back into the hill, as it zigzags down an even steeper slope to the little sheepfold at the complex corner of Ettrick Head. It continues in fine style, teetering along the steep banking high above the waterfalls of Selcoth Burn, with the grim scree scar of Craigmichen standing opposite. Early evening saw me at the handy bothy of Over Phawhope, with overnight stovewood ready stacked by the helpful ranger and last sunlight fading all along the Ettrick glen. But on the long hill ridges of the Southern Uplands, early evening is just too early. I pressed on upwards, leaving the official Southern Upland Way for the ridgeline to its north. Low sunbeams swapped dramatically with black rainclouds, with a momentary rainbow across the valley. Sunlight returned to sparkle on the freshly wetted grassland. And also, of course, on the freshly wetted me. I walked on for an hour as a way of hanging myself in the breeze to dry. And then hunted the downwind side of Andrewhinney Hill for a patch of sedges, squishy but not boggy, to unroll my bivvy bag. The sedge bank kept the night wind safely nine inches above my nose. No human light showed anywhere in the wide Southern Uplands; the grasses rustled sleepily; a single fencepost stood wonkily against the stars. Early morning ridges continued for four or five hours, before the faint grass path became a gravel track down to the twin lochs of Yarrow. And between the two waters, the ancient Tibbie Shiels Inn – the crucial overnight stop-off, whose closure in 2015 has turned the Southern Upland Way from a rather long long-distance path into something rather more remote and self-reliant. 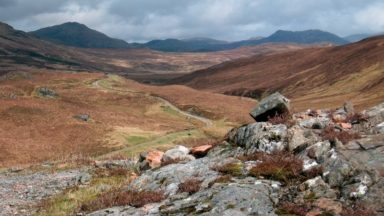 Through its 34-year history, the Southern Upland Way has been creeping slowly upwards like a slug on a rosebush. A small hilltop here (Craig Airie Fell, west of Bargrennan), a couple of bleak moorlands there (bypassing New Luce), a new viewpoint above the treetops in the other place (Penmanshiel, above the east coast). But 2018 sees the most radical bit of uplift so far, as 'official way' status goes to the new route over Croft Head in the Ettrick hills. The well-built zigzag path to the airy ridgeline replaces an uninspiring trudge through spruce and fir trees – although the uninspiring trudge does remain available for use in truly awful weather. 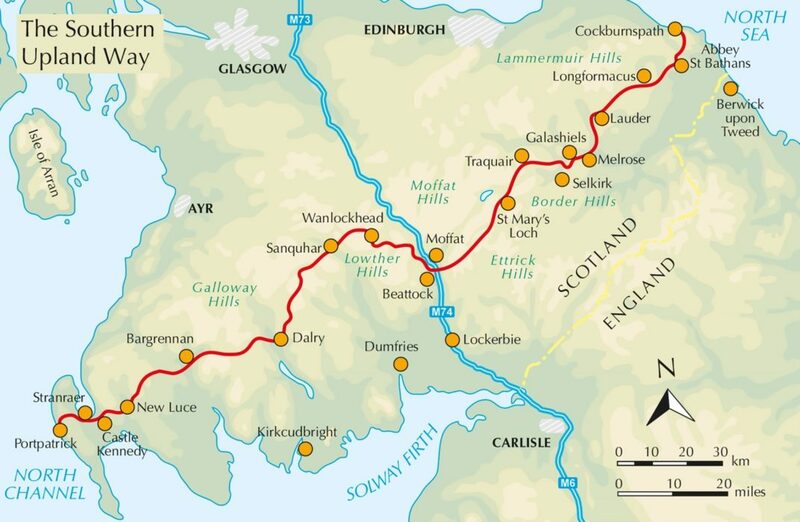 With this newly designated bonus section, and a new Cicerone guidebook and Harvey strip map out this summer, it seems like the right time to take another look at this, the toughest of Scotland's great paths. Is it, or can it be made into, a genuine UPland way? 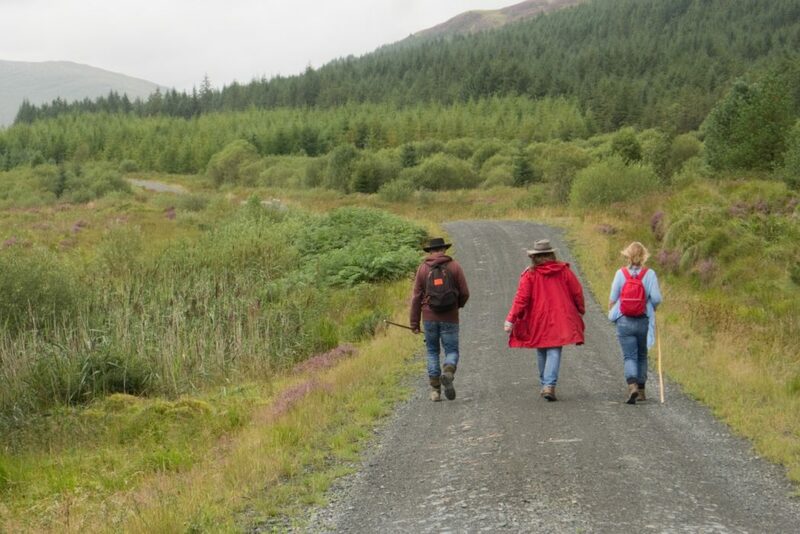 And given that a dozen folk a day, or fewer, walk its yellow-topped waymark poles, what's keeping us all away from this Southern Upland Way anyway? The Way's 14 sections average around 25km (15 miles) with 600m (2000ft) of ascent. From Section 6 east of St John's Town of Dalry through to Longformacus at the start the final day, every section involves high ridgeline above 450m altitude. The waymarking is excellent. 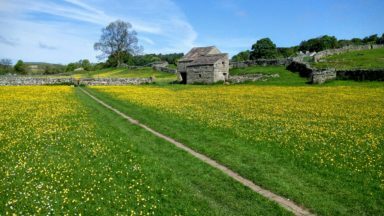 Apart from the occasional tiny bog to test the waterproofing of your boots, the going is on grassy paths, rough tracks and little tarmac roads. 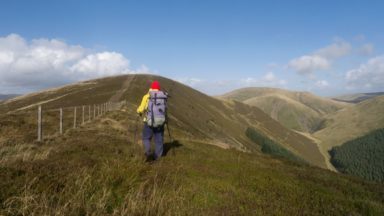 But, there are two downsides to the upland way. The first one is the cosy B&Bs and country inns, the friendly campsites and pretty villages. Too many of them don't actually exist… As the Way was originally laid out, two successive stages – from Bargrennan to St John's Town of Dalry, and from there to Sanquhar – were each over 40km. That's tough but do-able. But in 2015, the closing of the historic and ancient Tibbie Shiels Inn left a stretch of 55 hilly kilometres with no accommodation at all. What to do about this – short of growing yourself a pair of legs 33 miles long? One way to do the Way is to backpack it, carrying a tent and all the cookery stuff and the sleeping bag. And for a beginner backpacker, who wants the comfort of a waymarked path, there could hardly be a better option. 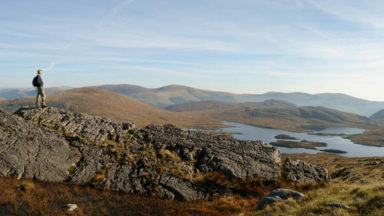 The hills are remote, but not so serious as the Scottish Highlands. There are no bottomless bogs, no dodgy rivers to cross, no cliffs to fall over. Resupply points are every couple of days. Each of the five wildest sections has a bothy to fall back on, for those dark and stormy nights when your frozen fingers can't quite fix the tent poles. 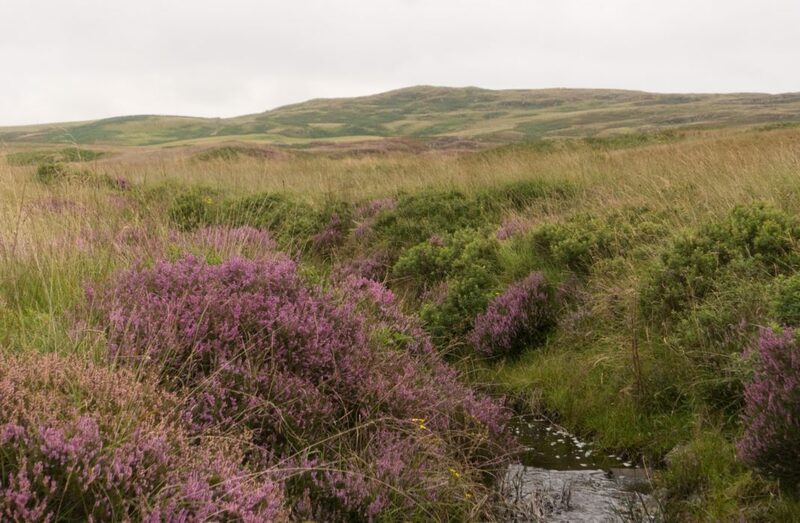 The latest update of the official website has come up with lonely B&Bs at New Luce, at the foot of Ettrick and at Longformacus. But for many, the solution is to use vehicle backup, from the Way's occasional road crossings to a nearby pub. Such pickups can be booked at five strategic points along the path, allowing doable days of which the longest is 30km (19 miles) with an average of 25km (15 miles). The little pickup vans do make the whole holiday rather more expensive. That could be the price you pay for a seriously remote bit of walking, with almost nobody about, found just a few hours’ train ride out of London. But did I mention a second disadvantage? Well, the Southern Upland Way goes all the way to Scotland's southwest corner at Portpatrick. 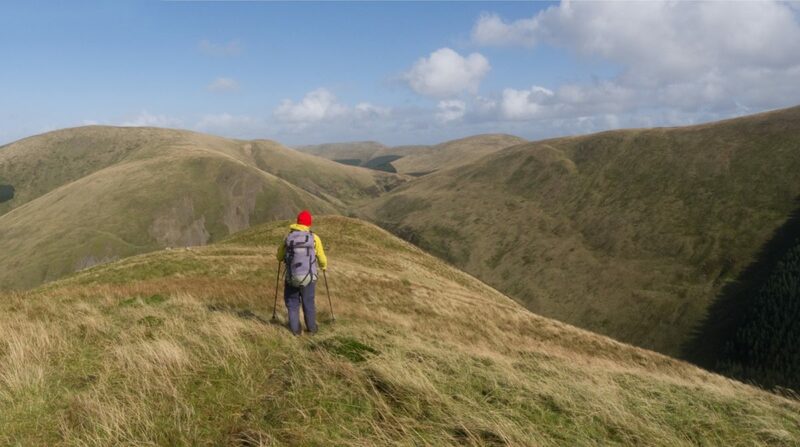 The Southern Upland Way goes all the way – but the Southern Uplands themselves do not. 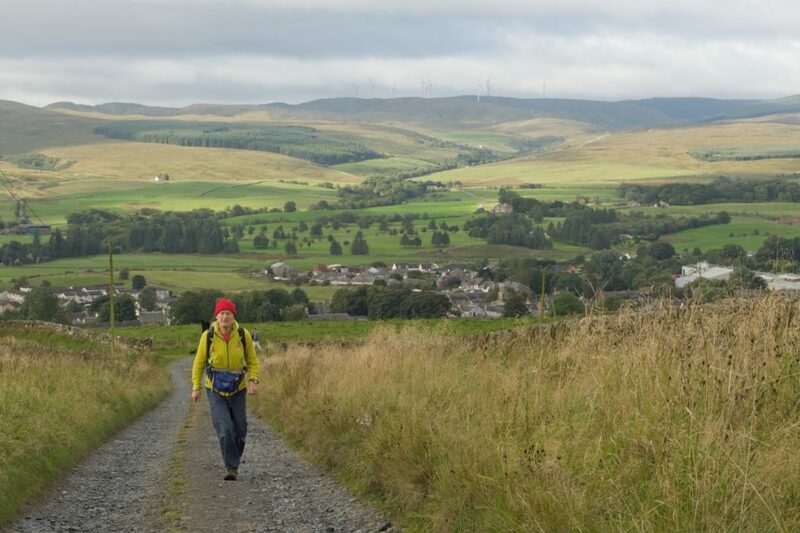 Starting, as most walkers will, at the western end, there's three full stages of Southern Upland Way before you get into the Southern Uplands. After Portpatrick's 2 miles of rocky shoreline, that means 60km of roads, tracks, farmland, windfarm-land and plantations. 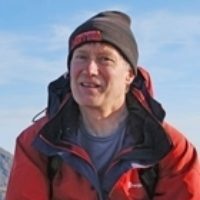 Recent improvements have added in two tiny summits: Ochiltree Hill at 184m and the not terribly towering Craigairie Fell at 320m. 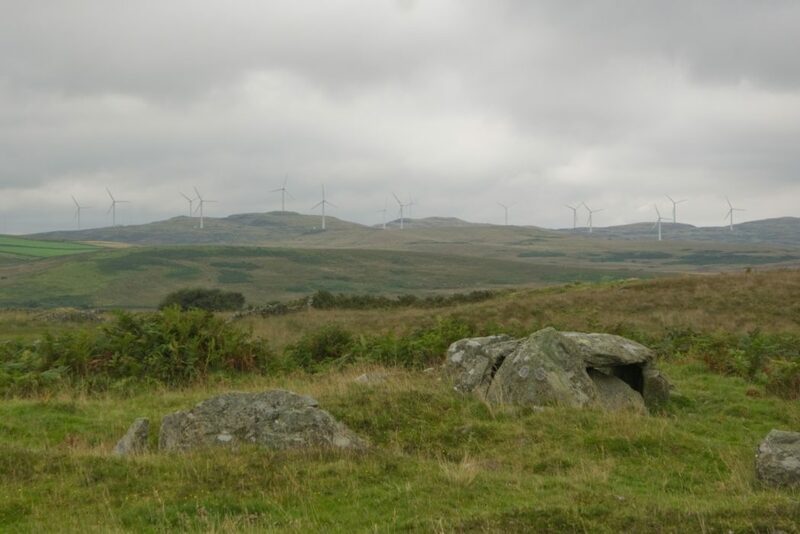 Recent disimprovements have embellished the Bronze Age sites of Balmurrie Moor with one of the UK's largest onshore windfarms. There are people who say they enjoy the first three sections of the Southern Upland Way, and I'm not saying they're mistaken. They have specialised tastes, is all. The pub at St John's Town of Dalry records that for quite a few of those who finish Section 4, that's the end of the walk. They clear off home. And that's a shame, as east of Dalry the Southern Upland Way actually is upland all the way. Grassy moorland will rise to Benbrack with its mysterious sandstone arch, and the high moorland crossing to Sanquhar. Green paths will lead through the romantically ravaged landscape of Wanlockhead, the lead mining village that's the highest in Scotland. There's a bumpy crossing of the Lowther Hills, followed by charming Moffat, and the new diversion over Capel Fell. 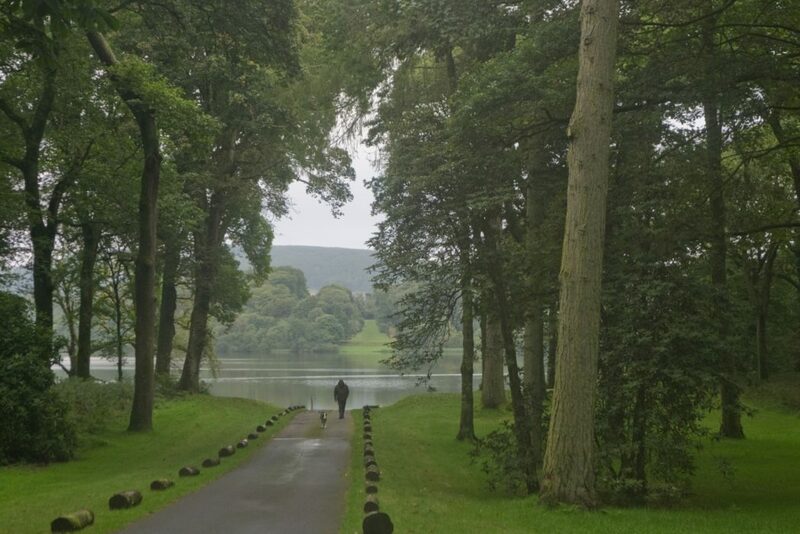 There's St Mary's Loch, and fast, grassy drove roads above the valley of the Tweed. And 10 days ahead, the harshly heathery Lammermuirs give your first view of the North Sea at the UK's eastern edge. Once into the real hills, there remain two slightly disappointing sections. Both of them can be improved on, for those prepared to wander away from the waymarks and take on a bit of extra up and down. From the Dalveen Pass to Beattock, after a low hill above Daer Reservoir, the Way dives into a deep and mossy plantation. The adventurous can leave the way at Wanlockhead, and instead take the ancient hill slot of the Enterkin Pass to the delightful, but facilities-free, village of Durisdeer. There's a bothy just beyond, which is a whole lot nicer than the one in the Annandale Forest. 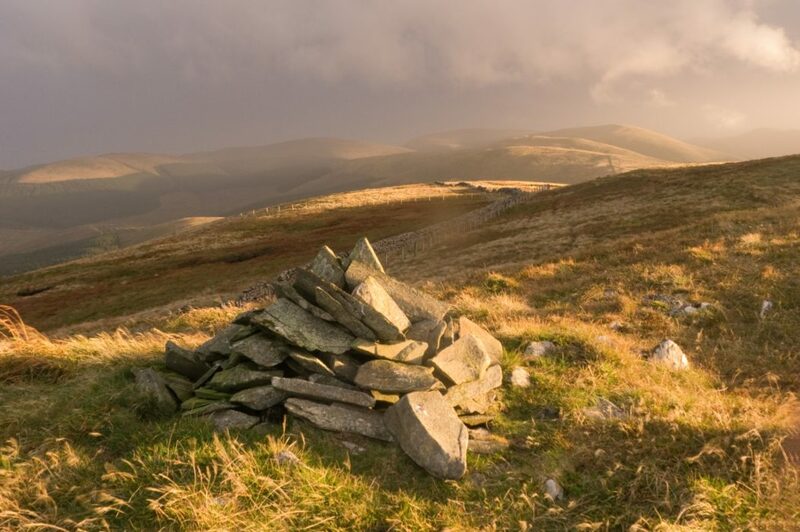 Grouse-shooters' tracks and the ancient cairn on Queensberry hill make the alternative way to Beattock. The following day, after the new high-level line over Capel Fell and the ravine-carved hollows of Ettrick Head, the way follows the charming but tarmacked Ettrick valley road. It follows it for 9 hard-surfaced miles. 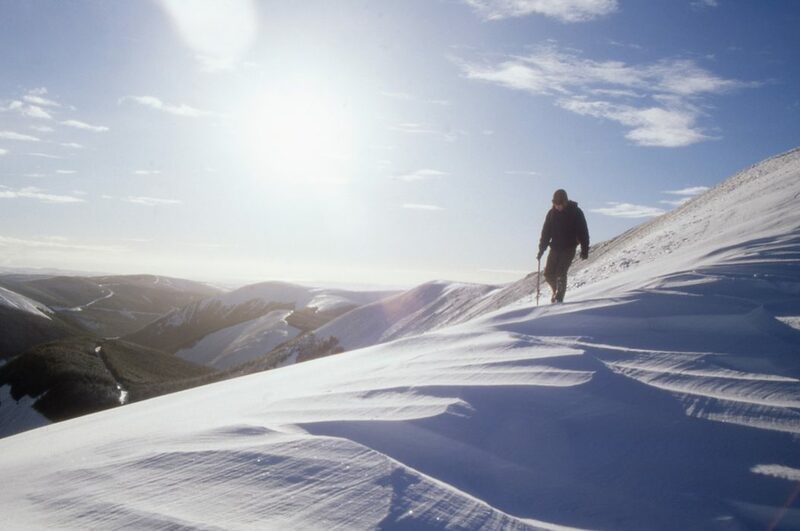 The alternative is to follow the valley's northern ridgeline, with half a dozen 2000ft tops and views across to the Moffat Hills. This is shorter than the Southern Upland Way itself, but because of the extra up and down takes at least an hour longer. GPS tracks for both of these alternatives are available via the Cicerone website. And what of the west? 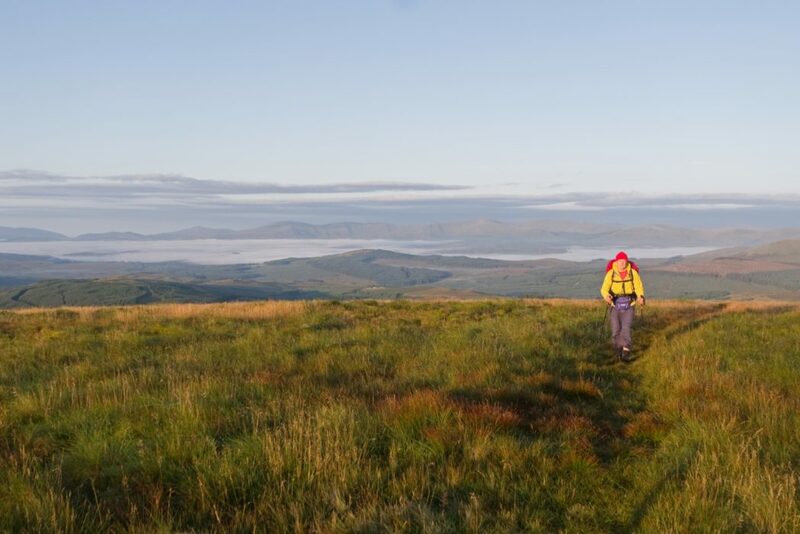 Those wanting a true coast-to-coast without the 60km of windfarm interest could start at Newton Stewart and head over Larg and Lamachan hills to join the regular Southern Upland Way in the heart of the Galloway Hills. A start (or finish) over Cairnsmore of Fleet, Scotland's most southerly 2000-footer is tougher, but worth it. And if you're feeling short-changed by the loss of a few western kilometres, you can add that in again at the eastern end. 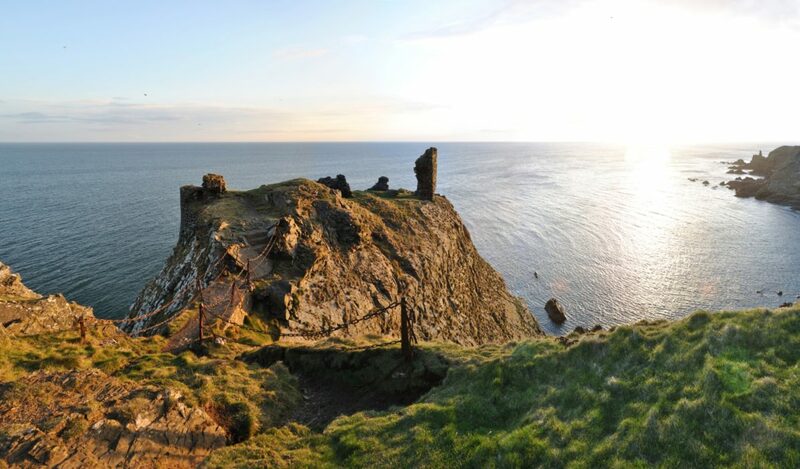 Turn right instead of left at the North Sea and follow the airy and wild Berwickshire Coast Path to St Abbs Head. Having crossed along the unofficial ridgeline above the Ettrick valley, I dropped to St Mary's Loch. I availed myself in imagination only of the beer and mutton pie enjoyed 200 years ago by Borders poet James Hogg and his mate Sir Walter Scott (but not alas by walkers of the 21st Century) at Tibbie Shiels. In a rare flat section, the way passes for 5km along the loch shore, then turns uphill past one of the pele tower fortresses you used to use when your neighbours arrived to kill you and steal your cows. The Way dodges uphill on grassy paths among meltwater valleys and little hillocks, ideal country for when you're running away from your neighbours driving the cows that you just stole from them. Another broken tower and a path up in a plantation leads to a grassy highway along the 450m contour, skirting the fringe of the Manor Hills. The pathway shrugs itself through a heathery col and starts a long, gentle descent towards the green spaces of the Tweed. Again, fast moving shower clouds are dappling the hills with shade. Again, chill raindrops rattle on the hood of my waterproofs. And again, a rainbow curves across the skyline. It seems to be indicating a pot of gold to be found somewhere among the cafés and cosy B&Bs of Innerleithen. The rainbow persists through the time it takes to unwrap the camera from its plastic bag. It's still there as I deploy the GorillaPod tripod and fasten it to a gate. Then, even as I'm carefully closing the gate and striding forward into the 10-second timer – surprisingly indeed, the rainbow still doesn't fade away. And there I have it. The cover photo for the new edition of Walking the Southern Upland Way. The Southern Upland Way asks more of the walker than a straightforward point-to-point between pubs. 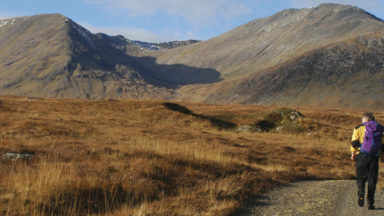 The UK's remotest ground south of the Highlands, and Scotland's toughest waymarked trail, is never going to be cosy and convenient. For those taking on its extra challenge, it offers its own rewards.